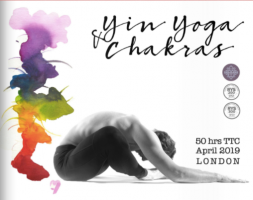 Join us in a 7-day intensive exploring the introspective practice of Yin Yoga on a journey through the Chakras and the group of muscles that help us activate each one of them. – Times: 9:15am to 5:15pm Tuesday to Thursday; 10:00am – 6:00pm Friday to Monday bank holiday. – Certification: 50 hours towards a Yoga Alliance RYT 200 & 500 Teacher Training Program. – Early Bird: £800 if full payment is received by 1st March 2019. – Non refundable deposit: £400 GBP to guarantee a place on the course. Full payment is required one month before the start date.